This is a simple side dish that turns even bulk, supermarket carrots into something special. 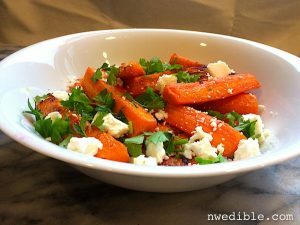 The combination of the sweet roasted carrots and the salty feta works really well together, and the parsley and lemon keep everything fresh and bright tasting. This dish couldn’t be simpler – toss carrots in olive oil and season with lemon zest and salt. High heat roast at 475-degrees, and finish the tender, caramelized carrots with a squeeze of fresh lemon juice, crumbled feta and chopped parsley. 2 oz. good feta cheese. Several stems Italian flat leaf parsley, rough chopped. Scrub and peel carrots, then slice each carrot into large matchsticks by cutting each carrot in half lengthwise, and cutting each half into quarters lengthwise. Toss the carrot sticks with the olive oil, salt, and the zest of the lemon until evenly coated. Slice the lemon in half and set aside for later. Scatter the carrots in an even layer on a parchment-lined sheet pan. 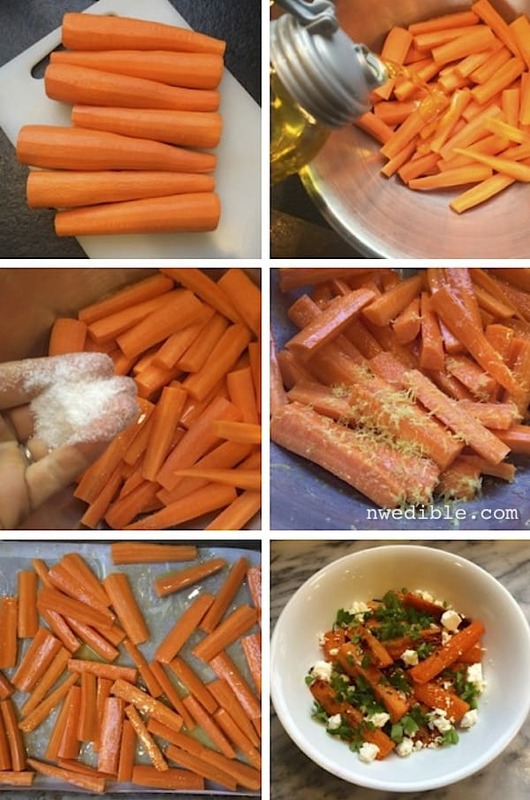 Roast the carrots for 15-25 minutes depending on the size of your carrot sticks. The carrots should be tender all the way through but not mushy, and should be nicely caramelized where they were sitting on the sheet pan. Squeeze the juice of half the reserved lemon over the hot roasted carrots and transfer to a wide serving bowl. 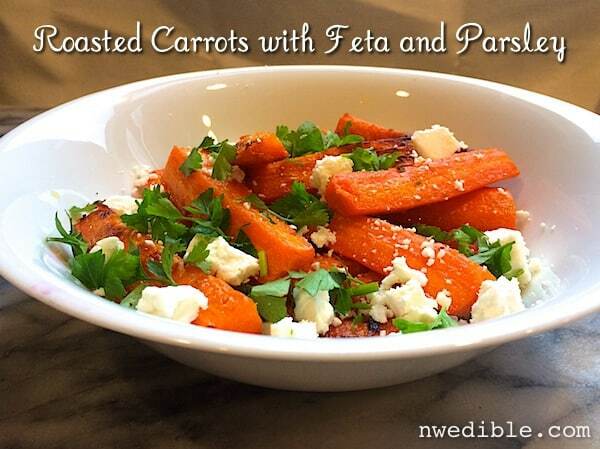 Crumble the feta over the carrots and sprinkle with chopped parsley. What are your favorite vegetables to roast? This sounds AMAZING! And I have so many carrots right now… thank you! These carrots sound so easy and delicious! I would love to try out other cheeses with them too–goat cheese or even a couple spoonfuls of labneh. In the same spirit: toss cubed butternut squash with olive oil and spices. I use a wonderful smoky ground chipotle from Epicure. Roast squash, sprinkle with feta and cilantro, serve with Quinoa. The fluffy quinoa is a nice balance for the dense squash. Wonderful! I love roasted carrots, and never thought to toss them with cheese at the end. We used to feed our rabbits parsley, and they LOVED it – this reminds me of them (and the carrots of course, which it turns out are like chocolate cake to rabbits. Or crack.). Have you been peeking inside my fridge? We ate roasted carrots at our neighbours house the other evening and somehow the conversation got around to feta cheese. Yesterday I took stock of what was in the fridge and found carrots and feta cheese. No parsley though but yesterday I did plant an indoor herb garden as it is so wet outside to plant anything.